I love this dress more than words can express. When I bought it, it was too cold to wear without some sort of outer garment. I’m thrilled to have warm enough weather to wear it with bare shoulders and show off the beautifully cut bodice. Such a perfect little piece. Wow! That dress is AMAZING! That dress is like a beautiful watercolor painting! Truly extraordinary on you. wow! those shoes and that dress were made for each other! I am in love with this!! The dress is absolutely amazing…and those shoes I would like to steal…please send them my way if they're a size 7ish! Oh my goodness, I would die for that dress! Oooh this reminds me of a really pretty Phillip Lim dress I got a while back but never have worn…they both have this kind of digital watercolor look to them! Beautiful dress! And your hair is gorgeous! Add me to the list of people that are totally smitten with that dress. It is flat out AMAZING, and your accessories complement it perfectly. P.S. My apologies for the deleted post above. It contained a spelling error that was going to drive me nuts. Gorgeous gorgeous gorgeous dress! The colors are so deep and rich, and the cut is perfection. It also matches your shoes perfectly. You are the pinnacle of sophistication. That dress really is a beauty, and paired with those sandals- could there be a more perfect match! What a perfect outfit! This dress is superb. You look terrific in it. That dress is like a beautiful painting! Love the color block shoes too. The shoes also go perfectly! Lovely colors on this dress! And the shoes are beautiful! That dress is so pretty and the shoes compliment it perfectly. its true. it is perfect!!! 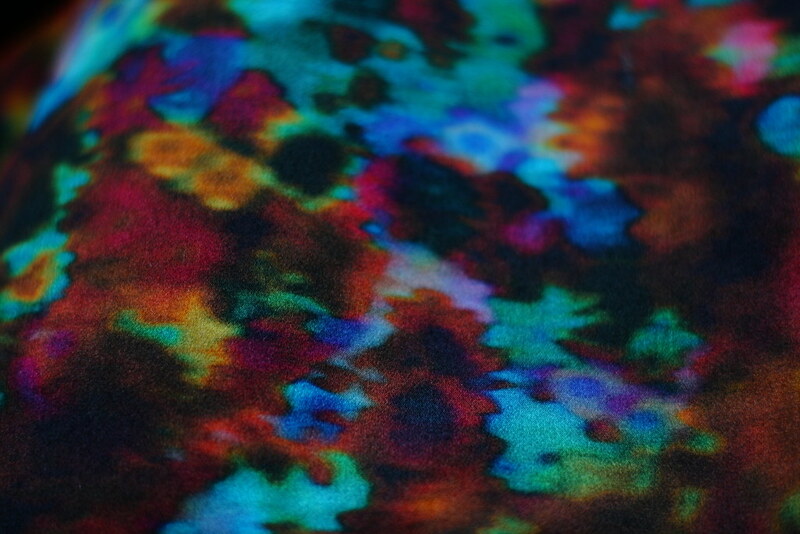 awesome psychedelic print on the dress!! The colors of this dress are stunning… watercolors meets stained glass window meets the queen's jewels. LOVE. Love the dress! You look so elegant! That dress is absolutely gorgeous!! I love that you didn't go with a neutral shoe. what a pretty dress. And those shoes are so fitting! It looks great for the summer, but with those colors, I bet it's a gorgeous fall piece too. Oh my gosh!! that dress is just perfection – and i cannot cannot get over how perfectly your shoes match! lurve it my dear! I completely understand your love affair with this dress…the print is unforgettable and beautiful! Love the dress. You look stunning. oh my this whole outfit is beautiful! I adore the dress and those shoes are just perfect with them! 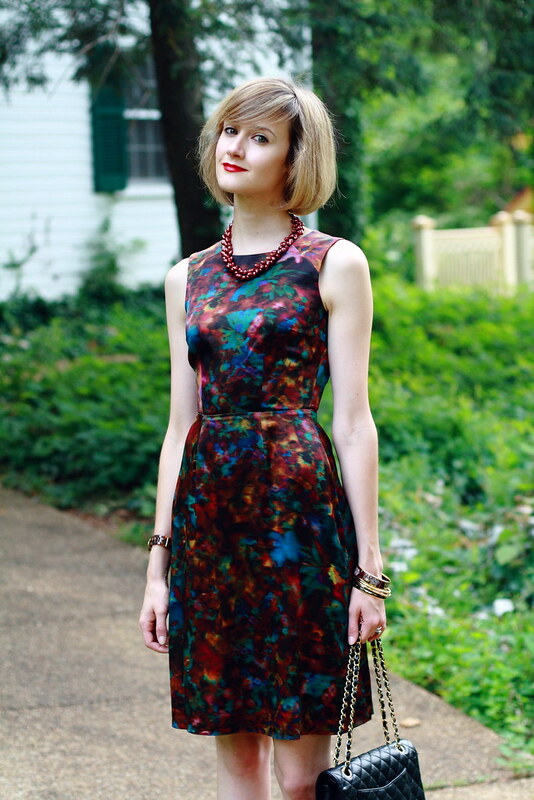 That dress is stunning; I'm loving the print & colors. I also like how your shoes match perfectly with it! You look absolutely incredible! That dress is amazing! great dress! I love the pattern! you are so beautiful! love the colors and could the shoes be more perfect? well, no, they could not. i love the jewel like colors in the dress. its stunning and also doesnt look like it would look good any most people but it suits you beautifully! there are few better things than being able to break out a dress that you've been waiting to wear all winter. so pretty, and i love the shoes as well. hope youre having a great 4th, E! I knew this was Erdem before reading the post. Erdem makes such great and standout pieces, with amazing patterns. Fantastic outfit! I love the dress, too. And those shoes are beautiful. Wow, Erin! You wear those jewel tones so well! Wow, I love this outfit! The dress, the shoes, everything!